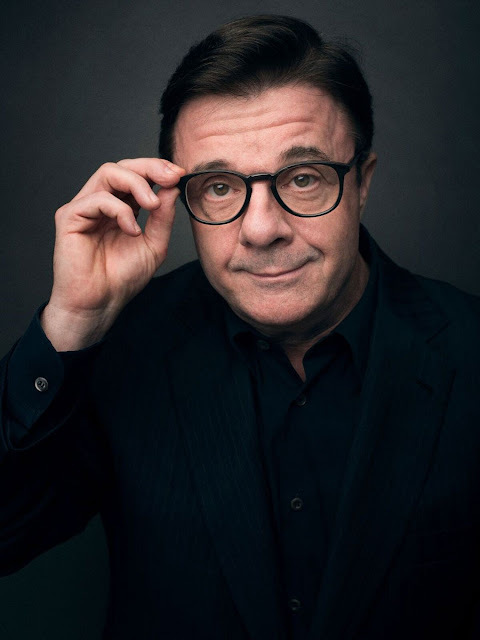 Nathan Lane was born today, February 3, in 1956. He is an actor and writer. He is known for his roles as Albert in The Birdcage, Max Bialystock in the musical The Producers, Ernie Smuntz in MouseHunt, Nathan Detroit in Guys and Dolls, Pseudolus in A Funny Thing Happened on the Way to the Forum, his voice work in The Lion King as Timon and Stuart Little as Snowbell, and his recurring roles on Modern Family, The Good Wife, and The People v. O. J. Simpson: American Crime Story as F. Lee Bailey. In 2006, Lane received a star on the Hollywood Walk of Fame, and in 2008, he was inducted into the American Theatre Hall of Fame. Lane was born Joseph Lane in Jersey City, New Jersey. His father, Daniel, was a truck driver and an aspiring tenor who died in 1967 from alcoholism when Lane was 11. His mother, Nora, was a housewife and secretary who suffered from manic depression and died in 2000. Lane attended Catholic schools in Jersey City, including Jesuit-run St. Peter's Preparatory High School, where he was voted Best Actor in 1974, and years later received the 2011 Prep Hall of Fame Professional Achievement Award. Accepted to Saint Joseph's University in Philadelphia on a drama scholarship, he was accompanied on what was supposed to be his first day there by his older brother Dan. Discovering that the scholarship would not cover enough of his expenses, he decided to leave, and work for a year to earn some money. "I remember him saying to me, 'College is for people who don't know what they want to do,'" his brother said. Because there already was a Joseph Lane registered with Actors Equity, he changed his name to Nathan after the character Nathan Detroit from the musical Guys and Dolls. He moved to New York City where, after a long struggle, his career began to take off, first with some brief success in the world of stand-up comedy with partner, Patrick Stack, and later with Off-Broadway productions at Second Stage Theatre, the Roundabout Theatre, and the Manhattan Theatre Club. He made his Broadway debut in a 1982 revival of Noël Coward's Present Laughter as Roland Maule (Drama Desk nomination) with George C. Scott. 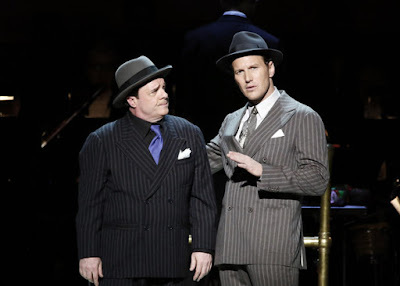 Patrick Wilson (R) and Nathan Lane perform "Guys And Dolls"
at CarnegieHall on April 3, 2014. In 1992, he starred in the hit revival of Guys and Dolls, playing the character who lent him his name, opposite Peter Gallagher and Faith Prince. For this performance, he received his first Tony nomination, as well as Drama Desk and Outer Critics Circle Awards. In 1992, he won an Obie Award for Sustained Excellence of Performance. His professional association with his close friend the playwright Terrence McNally, whom he met in 1987, includes roles in The Lisbon Traviata (Drama Desk and Lucille Lortel Awards); Bad Habits; Lips Together, Teeth Apart; Love! Valour! Compassion! (Obie, Drama Desk, and Outer Critics Circle Awards); Dedication or the Stuff of Dreams, which opened in 2005 (Drama Desk nomination); The Last Mile on PBS Great Performances, and the film version of Frankie and Johnny. The early 1990s began a stretch of successful Broadway shows for Lane. 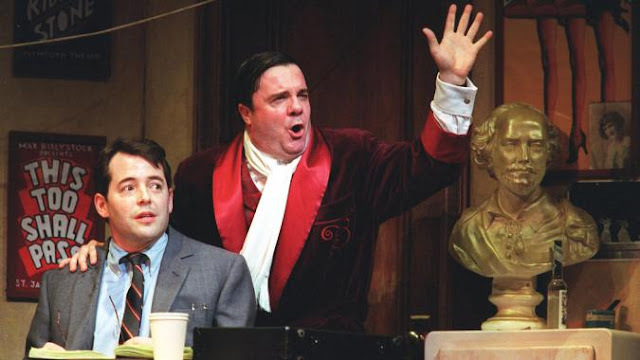 In 1993, he portrayed Sid Caesar-like Max Prince in Neil Simon's Laughter on the 23rd Floor, inspired by Simon's early career writing sketches for Your Show of Shows. In 1996, he starred in the hit revival of A Funny Thing Happened on the Way to the Forum, for which he won the Tony, Drama Desk and Outer Critics Circle Awards. In 1998, he appeared Off-Broadway in Jon Robin Baitz's revised 1984 comedy, Mizlansky/Zilinsky or 'Schmucks'. His association with Sondheim began with the workshop of Assassins. in 1989. In 1999, he appeared with Victor Garber in the workshop of Wise Guys (later retitled Road Show). His collaboration with Sondheim continued when Lane revised the original book for and starred in the Broadway debut of the composer's The Frogs at Lincoln Center in 2004. This was followed by the dark comedy Mousehunt, one of the first films to come out of the newly formed DreamWorks Studios, in which he co-starred with British comedian Lee Evans and Christopher Walken. 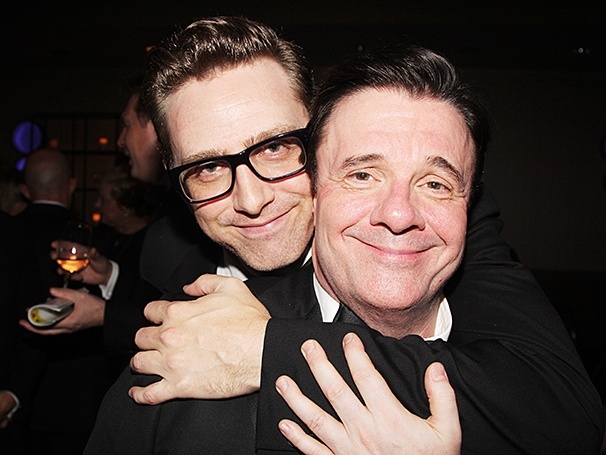 With Matthew Broderick in The Producers. In 2001, he starred as Max Bialystock in the blockbuster musical version of Mel Brooks's The Producers, a role that earned him his second Tony as well as Drama Desk and Outer Critics Circle Awards. In 2004, he replaced Richard Dreyfuss in The Producers in the West End. Dreyfuss was let go just a week before the show's first preview at London's Theatre Royal Drury Lane. Lane went on to win the Olivier Award as Best Actor in a Musical. He also starred in the film version of the musical. In 2010, Lane starred in the musical version of The Addams Family as Gomez (Drama Desk and Outer Critics Circle nominations). Committed to starring in a revival of the Eugene O'Neill play The Iceman Cometh at Chicago's Goodman Theatre in 2012, Lane assumed the role of Hickey, with Brian Dennehy playing the role of Larry Slade. Receiving rave reviews, it won six Jeff Awards, including Best Ensemble, Director, and Production, and is the most successful show to date in the theater's history. In the spring of 2013, Lane returned to Broadway in The Nance, a Lincoln Center production of new play by Douglas Carter Beane that was directed by Jack O'Brien. For this performance, he received Tony and Drama Desk Award nominations and won the Outer Critics Circle Award and the 2013 Drama League Award for Distinguished Performance. The play aired on PBS Live From Lincoln Center in 2014. In autumn 2014, he appeared in an all-star ensemble of Terrence McNally's revised and updated It's Only a Play, with F. Murray Abraham, Matthew Broderick, Stockard Channing, Rupert Grint, Megan Mullally, and Micah Stock. The show became one of the biggest hits of the season. In February, 2015 he reprised the role of Hickey in the Robert Falls production of The Iceman Cometh to great acclaim at the Brooklyn Academy of Music. He later returned to the Broadway run of It's Only a Play. In March 2016, he opened the play White Rabbit, Red Rabbit Off-Broadway. In fall of 2016 he returned to Broadway to rave reviews in an all-star revival of Hecht and MacArthur's The Front Page, directed by Jack O'Brien and produced by Scott Rudin. He played the ruthless editor Walter Burns opposite John Slattery as Hildy Johnson and John Goodman as Sheriff Hartman, for which he received Tony, Drama Desk and Outer Critics Circle award nominations. Following that he played Roy Cohn with Andrew Garfield as Prior Walter in the revival of Angels in America, at the Lyttlelton Theatre of the National Theatre of Great Britain. Lane is set to reprise his portrayal on Broadway at the Neil Simon Theatre, opposite the National Theatre cast. When Lane told his mother at age 21 that he was gay, she told him "I would rather you were dead" to which he replied, "I knew you'd understand." Lane publicly came out after the death of Matthew Shepard, and has been a long-time board member of and fundraiser for Broadway Cares/Equity Fights AIDS, and has been honored by the Human Rights Campaign, Gay & Lesbian Alliance Against Defamation, The Trevor Project, and the Matthew Shepard Foundation for his work in the LGBT community. On November 17, 2015, Lane married his long-time partner, theater producer and writer Devlin Elliott.